The Western River Cooter is a species of turtle that is of particular interest to the department. State-listed as threatened, very little is known about where it is found, what kind of habitat it needs at different life stages, and how it is doing in New Mexico. It is currently undergoing review by U.S. Fish and Wildlife Service to determine whether it should be listed as threatened or endangered at the federal level. Thus, time is of the essence in terms of answering some fundamental questions about this species and its status in the state. If the cooter were to be federally listed that would dramatically change the management landscape for this species. Dr. Ivana Mali and both graduate and undergraduate students at Eastern New Mexico University are using funds from the Share with Wildlife program, and other sources, to help fill some of the information gaps about the cooter. 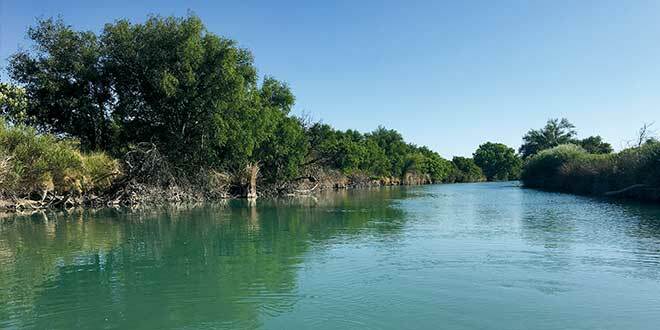 During the summer of 2018, Dr. Mali conducted surveys at two sites on the Black River in southeastern New Mexico that she and her team surveyed the past two years in order to provide the foundation for a longer-term dataset on this understudied species. Based on data from the past two years, this turtle is relatively abundant at both the survey areas. There are many hatchlings, which is potentially good news in terms of the sustainability of the population on the Black River. However, it isn’t possible to know how well the population is really doing and how many of these hatchlings, and older turtles, survive one or more years without collecting multiple years of data. Top: Western river cooter hatchling. Bottom: The Black River. Department photos by Ginny Seamster. Long-term data are especially important given the variability of the Black River system. For example, in 2017, the water level at the uppermost survey site was noticeably lower than it was in 2016. This raises questions regarding the impacts this variation in river flow may have on the ability of these turtles to bask, forage and lay eggs. In particular, lower water levels may make it harder for turtles to leave the water, which females must do in order to lay eggs. Very exciting news early on in the 2018 survey season was that Dr. Mali became aware of cooters being sighted in Chaves County and confirmed the sighting. There was a questionable historic record of cooters on Bitter Lake National Wildlife Refuge in Chaves County from 1951 and the predated remains of a cooter were discovered on the Refuge in 2008. 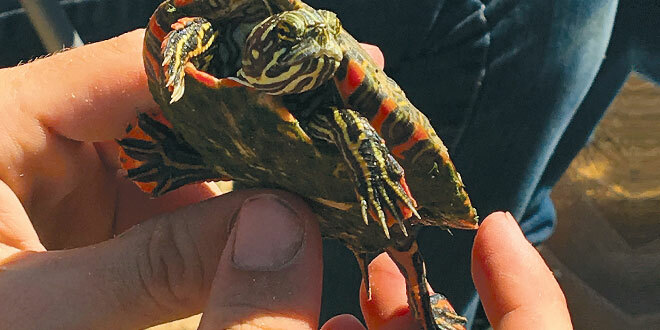 The fact that more than one live cooter was observed this year in Chaves County, relatively far north of Brantley Dam, its previously identified northernmost extent, is good news for this species. Very exciting news early on in the 2018 survey season was that Dr. Mali became aware of cooters being sighted in Chaves County and confirmed the sighting. Thus far for 2018, Dr. Mali’s team caught good numbers of turtles, both unmarked and marked individuals. To date, her team has marked 790 unique individuals on the Black River. New this year, they are collaborating with the Desert Willow Wildlife Rehabilitation Center in Carlsbad to X-ray larger turtles. The purpose of the x-rays is twofold: to assess reproductive condition of the females and determine whether individuals of either gender have ingested fish hooks. As the team analyzes this year’s data, it is likely that Dr. Mali and her students will make all kinds of interesting new discoveries and, most importantly, will be adding another year of data to inform our growing knowledge of this species and its status in southeastern New Mexico. Want to help wildlife in need of conservation? It’s as easy as filing out a line on your state tax return to donate some of your tax refund to the New Mexico Department of Game and Fish Share with Wildlife program. Since its inception in 1981, the Share with Wildlife program has funded many projects and organizations. A long-term recipient of funds is the New Mexico Wildlife Center, a non-profit in Española where sick and injured animals receive veterinary care, treatment and rehabilitation before being released back into the wild. The program also funds research, especially on species lacking information needed in order for species conservation and management efforts to proceed. Focal species for 2019 include the Bendire’s thrasher, an elusive bird found in the southwestern corner of the state, and the Peñasco least chipmunk, which is found only in mountain ranges in southeastern New Mexico. “People who contribute to the Share with Wildlife program make all these wildlife projects possible,” said Ginny Seamster, the department’s Share with Wildlife program coordinator. Donations to the program are matched by federal dollars to maximize the support for wildlife. More than $1.7 million dollars has gone to research, habitat enhancement, education and rehabilitation projects in the past 10 years. All donations fund projects, not program administration. The program is reliant upon donations, especially through tax refund contributions. To donate part of your state tax refund just fill out line two of PIT-D, the voluntary contributions schedule. Visit the state Taxation and Revenue Department at www.tax.newmexico.gov for tax forms and instructions.